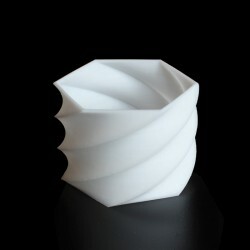 A planter with a stylish twisted hexagonal design. Ideal for cacti, succulents and other small plants. Size: this planter is 85mm across and it stands 60mm high. Made from PLA plastic and available in a choice of colours to suit your decor.